The Indiana woman has also served as the chairperson for the association’s show and contest, progress and amateur committees. Crull first got involved with Paint Horses when she was asked to exhibit a friend’s Paint Horse in a show. She liked the people and Paint Horses so much after that initial horse show that she decided to work on buying her own Paint Horse. She attended the Paint Horse Congress in Hutchison, Kan., in 1971 and purchased her first Paint Horse, HoJo, a decision she has never regretted. “HoJo turned out to be able to do everything,” said Crull. “I started going to every show I could ... I’d travel to several different states— just me, my horse and my dachshund.” He was the first horse to earn the Performance Versatility award. Crull has always been a strong proponent of the APHA Amateur program. She wrote the original Amateur rules and chaired the Amateur Committee for several years. The Amateur program offers Paint Horse enthusiasts the opportunity to compete and show their horses owned by family members against their peers, without having to show against professionals. These shows have the option of offering a single, all-ages Amateur class or splitting the competition into two divisions, one for Amateur exhibitors ages 19–44 and one for exhibitors aged 45 and older. At the APHA World Show there are several classes offered for both age divisions. Over the years, due to Crull’s tireless work, the APHA Amateur program has grown to become one of the most popular programs within APHA. During her many years serving as an APHA National Director, Crull was an important influence in many APHA rule proposals. She worked with the longe-line program to develop a set of standards that could be implemented by the association to ensure competitors knew what would be expected of them each time they showed. She also worked on the bit rule, to develop a list of acceptable standard bits to avoid the confusion of what was legal from year to year. Currently, Crull is focusing her time towards her regional clubs, the Indiana and Southern Indiana Paint Horse Clubs, and Zone 8. Zone 8 encompasses regional clubs within Michigan, Indiana, Ohio and Kentucky. Crull is most thankful to the APHA for providing her with the opportunity to serve and meet so many different people, including her husband, Kenny. 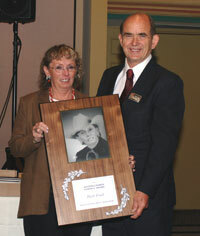 She and Kenny met at the 1977 APHA Convention in Hollywood, Fla., in March and were married that August. Over the years they have developed a strong breeding program, sending successful horses out into the show pen. 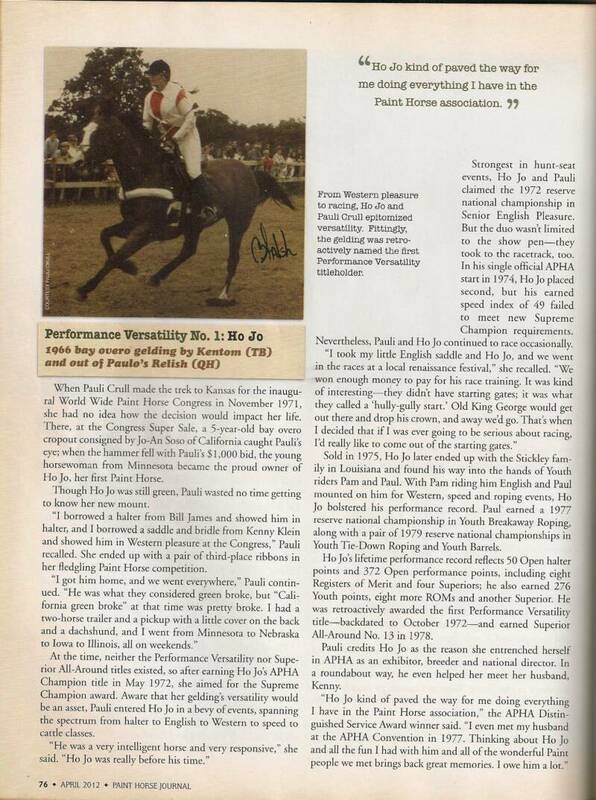 Their world champion stallion, Ollie Norfleet, continues to be a leading APHA sire, and the Crulls are recognized as some of the top breeders in the nation. “I’ve been so lucky that everything I get to do revolves around horses,” said Crull. Her latest venture has been obtaining her APHA judging credentials. She has been judging and enjoys traveling to different horse shows throughout the nation. After being an exhibitor since the late 1960s, Crull realizes the importance of the judging responsibility. “It’s wonderful to find something new to do within something that you have been doing all your life,” said Crull.